Repečkaitė cultivates particularly strict manner of writing. In this kind of music every move and detail is accurately prospected, the primal conception develops in to a well calculated system where all important aspects are balanced. Even music written for small ensembles has a degree of monumentality, as if it was a realization of designs dictated by higher powers. Repečkaitė’s musical language is complicated, but clear and readable. Gravitational waves ruling a piece determine ruthlessness’s of this aesthetics and there is no attempt to daydream or spend any time in the state of beauty. It is an intellectual move whose orbit is drawn with the sharpest pencil. Subscribe to Justina's Newsletter to get all the updates! It’s official: in September 2019 Justina starts Cursus Ircam! Cursus Ircam program for composition and computer music was initiated in 1990 under Pierre Boulez. At the end of 10 month program selected composers will have their final composition presented in concert during the ManiFeste festival at the CENTQUATRE-PARIS. Projects are supervised by Thierry De Mey, a team of 5 computer music designers/professors, IRCAM sound engineers, and professors from the Conservatoire de Paris. Justina started writing a new composition for the unique saxhorn quartet Opus 333. Commissioned by Radio France, it will be recorded for the radio show Création Mondiale produced and presented by Anne Montaron. In 2015 Justina has already collaborated with one of the Opus 333 musicians Vianney Desplantes who premiered her composition Toro for euphonium and tape. Justina will take part in the 25th Young Composers Meeting: February 25 – March 1, 2019 in Apeldoorn, The Netherlands. Her new composition Grimoire for baryton and big ensemble will be performed by orchestra de ereprijs. Justina has chosen the multilingual text from a medieval grimoire Ars Notoria. 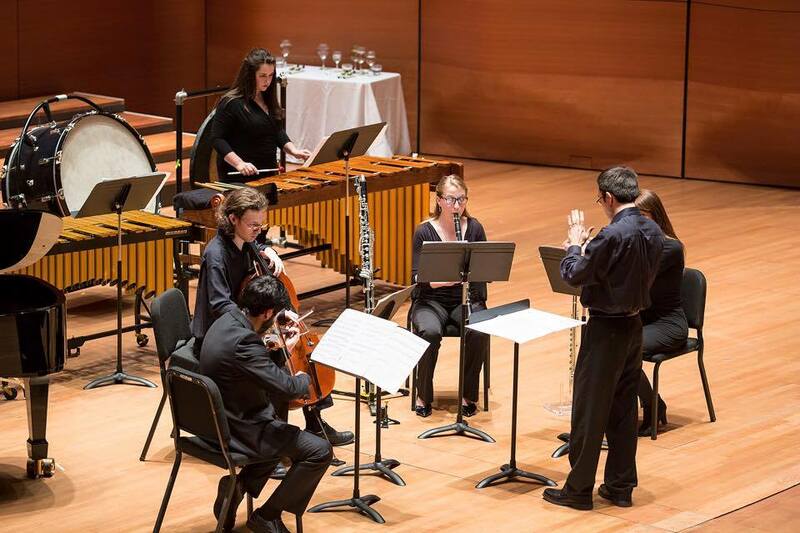 Tonight enjoy the streaming of the concert given by Ithaca College Contemporary Chamber Ensemble conducted by Kin Szeto at 7:00 p.m. Eastern Standard Time (New York time) here. Alongside Acupuncture (2014) and Tapisserie (2015) they will play Elliott Carter’s and Gregorio Jiménez’s pieces. Cosmatesque (2017) for orchestra was selected for the public favorite vote in the competition The Best Composition of the Year 2017 organised by Lithuanian Composer’s Union. Click here to vote. Thank you for your support! Ithaca College Contemporary Chamber Ensemble conducted by Kin Szeto will perform both Acupuncture (2014) and Tapisserie (2015) on the 15th of November at Ithaca College, NY. The 2018-19 season of ICCE features works by Husa Visiting Professor Stefano Gervasoni, Chen Yi, and Justina Repečkaitė. This week-end is the Nuit Blanche in Paris! My new composition Nénuphars will be played at Musée de l’Orangerie during Night of the quartet. My new composition Designation & Expulsion using the text of Lithuanian healing charms will be performed by mezzo-soprano Lucy Goddard, bass Jimmy Holliday and percussionist Philipp Lamprecht at the stunning Royaumont Abbey on the 8th of September. If you are around Paris, reserve the tickets here. Justina is off to Voix Nouvelles Academy in Royaumont near Paris where her new composition Designation & Expulsion for Mezzo-Soprano, Bass and Percussion will be performed by the soloists of Exaudi and Meitar ensembles on the 8th/9th of September. Her participation is funded by Sacem. This unique opening to the church will be a stage for my music! You can hear a part of my chamber opera INCANTA, text written by Douna Loup, on the 6th, 7th and 8th of July as a part of TOTEM(s) project here in Chartreuse Villeneuve lez Avignon. I have already started rehearsing at this Carthusian monastery with the energetic ensemble AskoSchönberg, soprano Eduarda Melo and a performer Aurélie Turlet. Le Balcon invites to a concert W I N D S which is a cinematographic, poetical and historical promenade in Paris from National Library of France to Athnénée Theatre, from Ludwig van Beethoven to Justina Repeckaite, Claude Vivier and Salvatore Sciarrino. Musicians from Le Balcon and Michael Levinas will be your guides. It’s the 6th ensemble playing Tapisserie! The Moscow Contemporary Music Ensemble was giving an Asian premier. For now MCME is the only ensemble daring to play the piece without a conductor. The incredible flutist Ivan Bushuev is able to play and conduct simultaneously without a flaw! Tapisserie was performed by MCME both at World Music Days 2018 in Beijing and also in Chengdu, during their residency at Sichuan Conservatory of Music. 6th-8th July 2018 a sketch of Justina’s opera Incanta (libretto by Douna Loup) will be played by Asko/Schönberg ensemble at Chartreuse in Villeneuve lez-Avignon, during Rencontres d’été festival. On 25th June 2018 Claire Luquiens will play Justina’s new composition for flute and electronics at Théâtre de l’Athenée, commissioned by Le Balcon ensemble and Singer-Polignac foundation. In 2018 Justina is a composer in residence with the ensemble Le Balcon in Paris. Le Balcon is an artistic collective that brings together an amplified orchestra, a troupe of solo singers and composers. It enriches its projects by inviting directors, videographers and choreographers to join the group. Alongside their activities as show producers, Le Balcon is also a record label, a music publisher – Le Balcon Éditions – and a web-TV – lebalcon.tv. Tapisserie will represent Lithuania at ISCM World Music Days in Beijing, China in May 2018. This piece has been played by several radios in different countries and performed by few different ensembles since its premiere by Ensemble Court-Circuit directed by David Hurpeau in 2015. It is also the second time when Justina represents Lithuania in World Music Days. Her piece Chartres was played there in 2015. See the list of selected works for World Music Days 2018. Read the announcement by Lithuanian Music Information Center. Since 2017, Justina is an artist in residence at Fondation Singer-Polignac. Estonian National Radio plays Tapisserie alongside Narbutaite’s music as part of the International Rostrum of Composers 2018 program. Premiere of Cosmatesque by Lithuanian National Symphonic Orchestra directed by Christopher Lyndon-Gee on 4th November 2017 at Philharmonic in Vilnius. Commission from the festival Gaida. In October 2017 Tapisserie was performed by ”Construction Site New Music Ensemble” at ”International Review of Composers” in Belgrade. On 19th August 2017 “Acupuncture” was played by “Ensemble SurPlus” at the “Academy Schloss Solitude” in Germany. Justina’s music is now accessible on iTunes: “Rapid Eye Movements” and “Tapisserie” appear in an album by “LENsemble” (Lithuanian Ensemble Network) conducted by Vykintas Baltakas. On 19th May 2017 Lithuanian National radio presented Tapisserie at International Rostrum of Composers the 64th edition in Palermo, Italy. On 9th to 13th May 2017 Justina attended project TOTEM(s) (Théâtre Opera Texte et écriture musicale – Theatre Opera Text and musical writing) at Chartreuse (Carthusian Monastery) in Villeneuve lez Avignon, France together with other composers and writers. Premiere of composition “Dumtakah” for derbouka, flute, clarinet, violin and cello performed by The Egyptian Contemporary Music Ensemble and LENsemble (conductor Vykintas Baltakas) at Goethe-Institute during Cairo Contemporary Music Days on 27th April 2017. Justina’s piece “Rapid Eye Movements” appears in an album “Anthology of Lithuanian Art” curated by Franck Oteri. On 16th December 2016 “Chartres” was performed during a concert Compositrices d’Aujourd’hui (“Female composers of today”) by Ensemble 21, conductor Elena Schwarz, at the Haute Ecole de Musique of Geneva, Switzerland. On 27th November 2016 “Acupuncture” was played for the 3rd time in Austria at Schloss Porcia by Ensemble MusikFabrikSüd, conductor Bruno Strobl. American premiere of “Tapisserie” at Eastmann School of music in Rochester by “OSSIA” ensemble on 6th October 2016, conductor Vicky Shin. Premiere of string quartet “Unbenannt-2” by musicians of “Ensemble X.Y.” during the festival “Hearing Art Seeing Sound” at Contemporary Art Museum of Yerevan, Armenia on 9th July 2016. Justina’s music sounds in a play “Femme. Monologues” (“Women. Monologues”) where she performs alongside Rémy Reber, Raisa França Bastos and Thales Branches at Ecole Normal Superieur, Paris. Justina gives a public interview on Skype before her composition “Chartres” is performed by “FoMString Orchestra” conducted by Ivan Markovic in Belgrade, Serbia. Designation & Expulsion (2018) for mezzo-soprano, bass and percussion. Performed by mezzo-soprano Lucy Goddard, bass Jimmy Holliday and percussionist Philipp Lamprecht at the Royaumont Abbey, France on the 8th of September 2018. INCANTA (2018) a preview of chamber opera for Soprano, Performer, Clarinet-Bass Clarinet, Trombone, El.Guitar, Piano, Violin, Cello, Double bass, Electronics. Text by Douna Loup. Performed by ensemble Asko/Schönberg conducted by Joey Marijs, soprano Eduarda Melo, performer Aurélie Turlet, electronics Justina Repečkaitė at Chartreuse Villeneuve lez Avignon, 2018. Cosmatesque (2017) for Symphonic Orchestra. Commission of the festival Gaida. Performed by Lithuanian National Symphony Orchestra, conductor Christopher Lyndon-Gee, at Vilnius Philharmonic the 30th of November, 2017. Cosmatesque term refers not only to a medieval style of geometric decorative inlay stonework but also to a developed symbolical system, which represents concepts and ideas of a universe structure thanks to the coded geometry. Tapisserie (2015) for Flute, Clarinet, Piano, Violin, Violoncello. Performed by Court-Circuit ensemble conducted by David Hurpeau. Toro (2015) for Euphonium & Electronics. Dedicated to and performed by Vianney Desplantes. Acupuncture (2014) for Flute (Piccolo and Alto), Clarinet (both in Bb and Bass), Piano, Violin, Alto, Cello. Performed by Spectra Ensemble conducted by Filip Rathé. In memory of Dalia Baroniene, the acupuncture master. Pulsus Flatus Vox (2014) for Flute-Alto Flute, Clarinet-Bass Clarinet, Horn, Trumpet, Trombone. Performed by Ensemble Intercontemporain during Manifeste festival at Le Centquatre, 2014. Chartres (2012) string orchestra (9 violins, 3 violas, 3 cellos, double-bass). Performed by St.Christopher Chamber Orchestra conducted by Karolis Variakojis.